LRaw materials are brought by trailer from surrounding flax cooperatives. These are positioned on a hydraulic tip-up bench, which tilts the trailer on its side in order to speed up the process of unloading the raw material into the pit. Only flax shives are resistant enough to be incorporated into the boards. That is why any waste (dust, tow, threads, etc…) that could change the boards’ mechanical characteristics is eliminated. This stage helps to increase the shives’ absorption capacity. Indeed, depending on the weather and the seasons, the humidity of the raw materials supplied is extremely variable and often very high. However, the shives needing to be dry for the glue to be absorbed, they are placed under dryers. This stage will separate fine and short shives from the larger one. Fine shives will be used to manufacture the top surface layer of the board. Larger shives will constitute the middle layer and make the board more rigid. The “three layer” board obtained cannot be manufactured in exactly the same way in every factory for technical and cost-related reasons. The fine and large shives are pasted separately in two different sizing machines. The shives are then mixed with thermosetting glues. 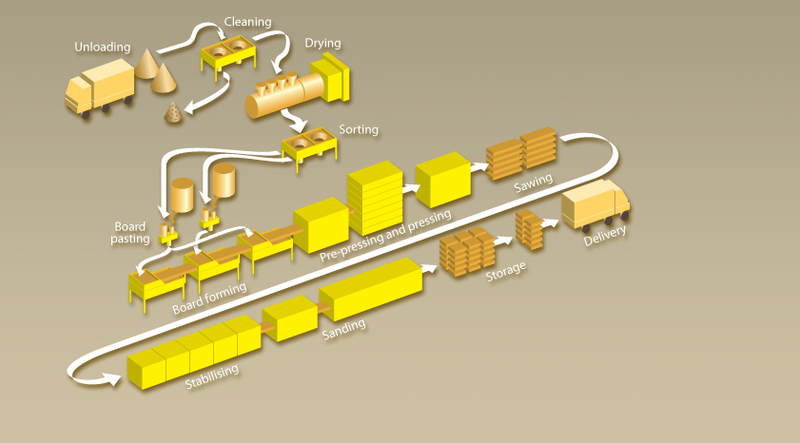 The pasted shives are formed in three forming machines, one to disperse the lower ‘fine’ layer, a second for the “thick” layer and finally a third for the upper “fine” layer. The ratio is of 85% thick to 15% fine shives. Three layers of shives are placed on the forming belt (in fine, thick, fine order). The formed mat has just been created. The prepared formed mat is put through a continuous pre-press to reduce the height of the mat and to interweave the particles in order to give the formed mat a sufficiently solid texture for withstanding a speedier production line. The formed mats are then stored in lots of nines and hot pressed. The press can go up to temperatures of 200° with 3,000 tons of pressure. As soon as the press is opened, the nine boards are automatically taken out. The weighing machine then checks their final weight and they are stored at the cooling station. Just after the cooling stage, the boards are put through a longitudinal moulding machine that reduces the width of the board. Then they are put through three transversals saws to be cut into two or three pieces, depending on the order. Sanding is the last operation before the boards are stored in the hanger. This stage helps to grade the thickness of the boards precisely before they are taken to the automatic packaging lines.